Mull's only Scotch whisky distillery produces both peated an unpeated whisky for use in the Black Bottle and Scottish Leader blends, as well as for Ledaig and Tobermory single malts. It is likely that in its earliest incarnation Ledaig was a peated malt, but in more recent times both peated and unpeated whisky has been made and bottled as both Ledaig and Tobermory. Thankfully, this has now been resolved with Ledaig now only being used for the heavily-peated variant. Equal amounts of both styles are currently being made. The fermentation time is relatively short, but it is the unusually shaped stills which lie at the heart of the Tobermory style. They have both boil bulbs and a strange S-shaped kink in their lyne arms, all of which increases reflux. Today, the single malt bottlings are non-chill-filtered and bottled at 46.3% abv. 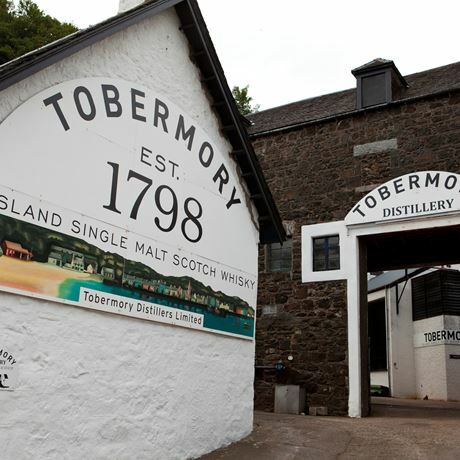 Mull’s capital may have been built by the Stevensons of Oban [see Oban], but Tobermory’s distillery has had a more chequered career than its mainland relative and with considerably more unusual owners. It was established, as Ledaig, in 1798 by John Sinclair but like many small sites, the business foundered and it seems to have been silent between 1837 until 1878 when, after a succession of owners, it was finally brought within the DCL estate in 1916. It continued to produce until 1930 when it fell silent for over four decades. A belated member of a group of old distilleries which were recommissioned in the post-war whisky boom, it was brought back in 1972 by a somewhat unusual joint venture between a Liverpool shipping company, Sherry producer Pedro Domecq and “Panamanian interests”. This unusual arrangement only lasted for three years, although the new owners renovated the distillery and increased capacity. A short further period of silence ended when a property firm based in Cleckheaton, Yorkshire bought it with the intention of converting some of the buildings to holiday accommodation. Others were used as a facility for storing cheese. It closed again in 1982 for 11 years when its current owner, Burn Stewart (now part of South African giant Distell), purchased it. 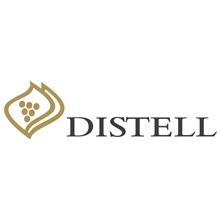 In January 2017 Distell announced a major refurbishment plan for the distillery, which would force its closure for two years from 31 March. However, Tobermory's visitor centre would remain open throughout the period. 1916 DCL takes over John Hopkins & Co.
Subsidiary of Burn Stewart Distillers that operates Tobermory distillery on Mull. The holding company created to build and operate Isle of Harris distillery. Indie distiller based on Isle of Arran.